Vail Pass is a high mountain pass in the Colorado Rockies just west of the Continental Divide. Vail Summit is located on Interstate 70, about 10 miles east of the town of Vail, Colorado. I-70 on both sides of the Vail Pass Summit has a steep descent. Vail Pass is one of three steep grades on I-70 between Denver and Utah with Eisenhower Pass to the west and Floyd Hill to the east. 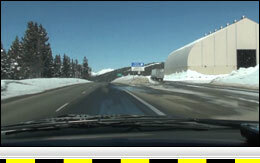 Vail Pass receives a large amount of snow in the winter and often has chain restrictions for commercial trucks. 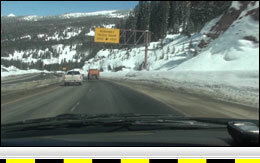 Westbound I-70 from the Vail Summit has a vertical descent of 2,267 feet over a distance of 9.4 miles. The reported grade for the westbound descent is 7% for 7 miles. The grade is steady for approximately 5 miles, where it flattens for a 1/2 mile or less before continuing its steep descent for about 4 more miles. 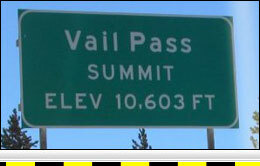 Eastbound I-70 from the Vail Summit has a vertical descent of 1508 feet over a distance of 12.7 miles. The eastbound descent is stepped with grades varying from steep to moderate. At the 195 milepost, the grade flattens for about a mile before continuing a lesser descent to the 205 milepost, where an uphill transition is encountered. Several ski areas are located in this area and traffic, particularly in the morning and late afternoon during the ski season, should be expected at the exits between mileposts 195 and 205. Runaway Ramps: One on right at 3.5 miles from summit. One on right at 7.0 miles from summit.